The nastiest piece of work I have ever had the misfortune to encounter called himself a director of human resources. Short, stocky and bullet-headed, he exuded the poorly repressed anger of a fanatical rugby forward who has had his career cut short for causing one fatality too many in the scrum. I only listened to him for about ten minutes, but he managed to pack into them more gratuitous abuse than I would have thought humanly possible – and I write that as something of an expert at dishing it out myself. He even beat the colourful soliloquies on my total inadequacy dispensed each week by my would-be PT instructors at the Royal Grammar School 40-odd years ago. Naturally I stood up and told him where he could stick his consultancy agreement. So ended what had been, until then, a harmonious relationship of more than two decades with one of my larger and more profitable clients. It was only as I was sitting on the train home, enjoying my sense of liberation, that I realised how easily I had fallen into his trap. The man had been engaged to undertake a spot of “downsizing”, and reducing the impressionable to jelly with an exaggerated account of their deficiencies was provoking widespread resignations and so saving the company a fortune in redundancy pay. No doubt he pocketed a significant performance-related bonus for his excellent work. The irony was that he wasn’t actually meant to fire me, as subsequent messages from his superiors made clear. He did it partly because he had summoned the wrong PR adviser to a meeting, but mainly because he could not stop himself. He just adored his work. 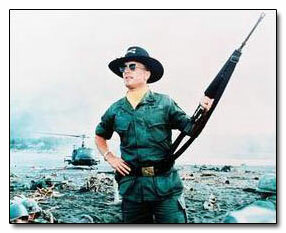 Come to think of it, he bore a striking resemblance to that deranged American commander in Apocalypse Now who loved “the smell of napalm in the morning”. At least I could understand the blunt Anglo-Saxon of this uncharacteristically non-PC HR director. Unlike the first time I ever met anyone who professed to work in “human resources”. This was back in the 1980s over lunch with a departmental head and his deputy, with a view to conveying their viewpoint in a forthcoming annual report. I was accompanied by a member of their company’s finance team, which was lucky because his presence enabled me to escape the conviction that I had wandered into a parallel universe. Comparing notes afterwards, it swiftly became clear that neither of us had understood a word that the HR supremos had said. I wrote a page of gibberish, peppered with authentically modish buzzwords, which I intended principally as a joke. To my surprise, the HR department told me that I had captured their ethos to perfection. This was in a company, I feel compelled to add, that also boasted a famously incomprehensible finance director. Recognising that only a fine line separates genius from lunacy, his board colleagues concluded that his oracular pronouncements denoted utter brilliance. Sadly his later career demonstrated that this was a serious misinterpretation of the facts. To this day I baulk at writing about employees as “human resources”. They are people. Colleagues, if you wish. Partners, if you can back up that claim with real participation in the style of John Lewis. Staff, if you must. But never “resources”, which is a noun that surely sits naturally only with the verb “exploit”. And just because it is a terrible, numbing cliché to say that people are the most important assets of any company (with the possible exception of Acme Elephant Hire), it does not alter the fact that it is profoundly true. Yes, your people need training if they are to do their jobs properly, but surely the answer is to keep it relevant and succinct. Ideally dispensed by someone who has made a huge success of actually doing the job in question, rather than devoting themselves to “blue sky thinking” and dispensing advice. This might seem rich coming from a PR man, though nothing has ever worried me more than being shown around a business and thinking that even I could run it better than the incumbent management (a judgement that subsequent developments have usually tended to prove correct). The happiest and most successful companies I know have all been run by people with a touch of madness in their make-up. It takes one to know one, which is no doubt why we got on so well. Their insanity tended to manifest itself in a willingness to take risks and to defy conventional wisdom. Such organisations are likely to take a more than averagely relaxed approach to corporate governance and the best of them don’t have anything to do with “human resources”. They have people, and they treat them with care and consideration, reward them fairly, recognise their successes and have among their corporate objectives one very important intangible: having fun.